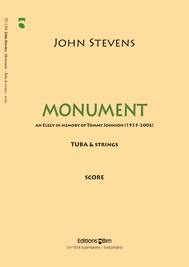 John Stevens (below) is a professor of tuba and euphonium at the University of Wisconsin School of Music where is a member of the Wisconsin Brass Quintet and the newly elected director of the school. 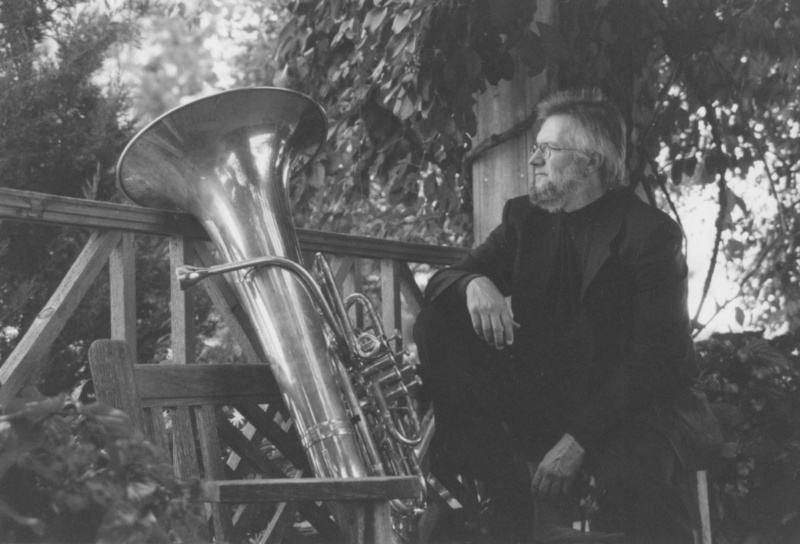 Trained at Yale, Stevens is also a nationally known composer and arranger. So it was natural that the Wisconsin Foundation for School Music, a statewide organization headquartered in Waunakee, would turn to him for a commissioned piece to honor Marvin Rabin (below), the 94-year-old founder of the Wisconsin Youth Symphony Orchestras. You can also call the Wisconsin School Music Foundation for reservations and information at (608) 850-3566. 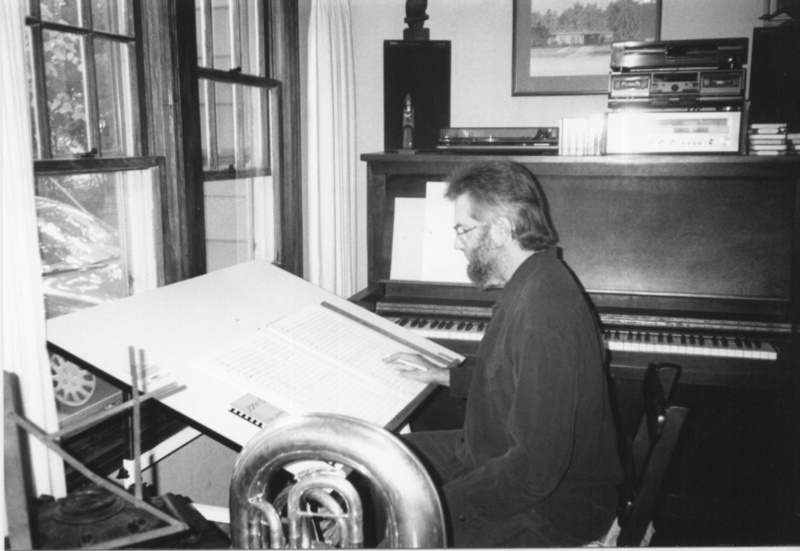 Stevens (below) recently gave a Q&A interview about composing and about the Rabin commission to The Ear. Here it is in two parts. Today he talks about the specific piece he wrote for Marvin Rabin. Tomorrow he will talk about composing in general. Did you know and work with Marvin Rabin personally? If so, how did that affect your composition? While Marvin Rabin and I could not be described as close friends, we have been colleagues and acquaintances since I joined the UW-Madison faculty in 1985. I have known Marv as the immensely dedicated musician and educator that he remains to this day. He is a man with a quick mind, a joyous appreciation for music as an art form and for great performances of music – especially by young people. He has an incredibly expressive face and demeanor, and loves to talk — always quite eloquently — about the meaningfulness of music and the performances he attends. 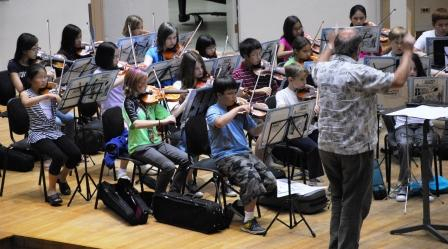 It is his appreciation for and skill at connecting young people (below) with the joys of music-making that is, in my opinion, his greatest gift. Although I couldn’t cite chapter and verse of his career in great detail, I am certainly aware that the Youth Orchestra movement in this country would probably not be as successful as it is today without his vision and guidance. I consider it to be very much an honor to have been asked to compose a work for this special recognition of Marvin Rabin’s life and achievements. My knowledge and awareness of him as a musician and, more importantly, as a person, certainly had an impact on the composition. His physical image, conversations that we have had and, most particularly, the rather incredible energy he still maintains despite his age and health issues, were all in my mind constantly as I composed this work. What would you like student performers to know about your “Fanfare for an Uncommon Man”? In addition to the above, I will tell them that the work is intended to be respectful, powerful, celebratory and uplifting, and to communicate a sense of honor that is appropriate to the man and the occasion. One special note is that I chose to use material that I first used in a brass choir and percussion work that was commissioned for me to compose about 8 years ago for the Elgin (Illinois) Youth Symphony Orchestra Brass Choir. 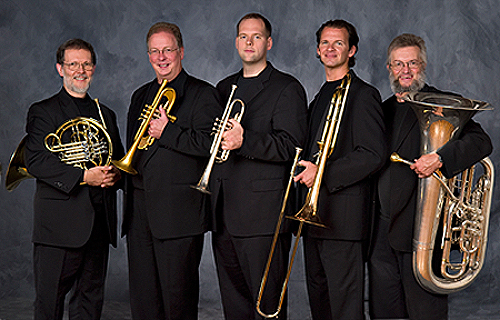 The entire EYSO program is directed by UW alumnus Randy Swiggum, and the Brass Choir is directed by Jason Flax, one of our former undergraduate trumpet students. I felt that it was appropriate to “borrow” material that I had used in the only other piece I’ve composed especially for a Youth Symphony program. It seems to me that Marv’s greatest legacy will be the growth and development of the Youth Symphony. What makes Marvin Rabin “uncommon”? Well, my answer to the first question probably suffices for this one as well. He is a lovely man, with an “uncommon” sense of joy about music and young people. He is also a unique character with a lot to say about anything that might come up in a conversation having to do with music. His energy and enthusiasm have always been infectious, and they still are even though he is well into his 90’s. How did you decide on the scoring? Does your performing influence your composing? Given the nature of the occasion, it seemed appropriate to compose something for brass and percussion. The music is meant to be a splash of celebration, joy and respect for Marv. The team representing the Wisconsin School Music Foundation and responsible for putting this event together was very pleased with that idea, so on we went. I have always said that my career as a performer very much influences my composing, just as my career as a composer very much influences my performing. I find that when I’m playing, I think like a composer; and when I’m writing, I think like a performer. As a composer, I am always aware of the practicalities of the performance process. Knowing not only what it sounds like to play a certain “thing,” but to know what it feels like as well is a big part of writing idiomatically for the instruments. Because I’m a tubist, I’m the most comfortable writing for brass. But although there are certain instruments and genres that I have not had time to explore, I would be happy to undertake virtually anything. I’m eternally grateful to all the fine musicians and colleagues who have patiently answered my questions or demonstrated techniques for me over the years in areas with which I’m less familiar – strings and percussion for example. The collaborations with performers are among the most enjoyable aspects of being a composer. What would you like listeners to know about the Rabin piece? I think my previous answers have covered this. I do not compose in an “avant-garde” style, creating music that is “challenging” for the listener. It isn’t meant to be “easy listening” on the other hand, but the audience should readily grasp not only the musical impact of the work but also the personal nature of the message that the music conveys. I don’t mean personal as in between Marv and me. I simply mean that the piece has a purpose beyond what is written on the page and subsequently played by performers, and that is to create both a reverence and excitement about the occasion. The work is essentially in two sections; the slower, more “reverent” section followed by the faster, more “exciting” section. It’s about 4 minutes in length – more than a fanfare, but meant to serve essentially the same function. 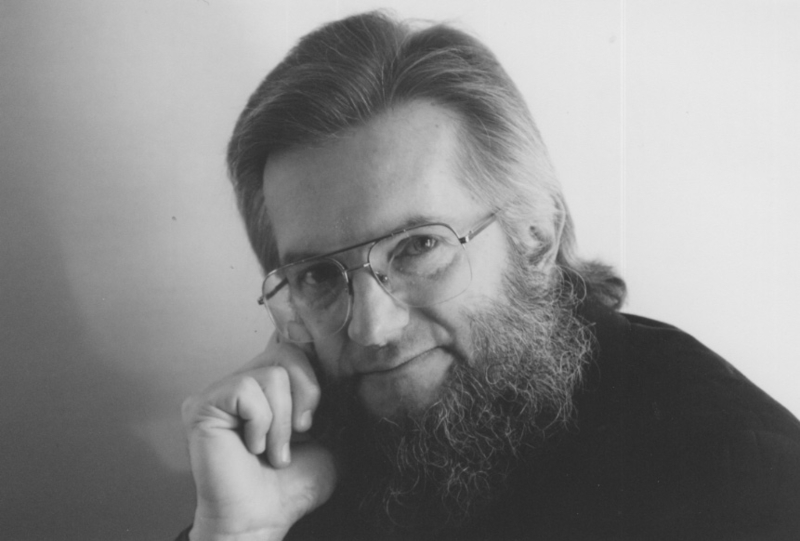 Tomorrow: Part of 2 — How does a composer compose?